The lure of Microstepping a two-phase stepper motor is compelling. Visions of Microstepping a 1.8-degree hybrid stepper motor with 256 microsteps per full step flash in your mind. The resolution of 51,200 microsteps per revolution entices you. You’re glad you don’t own stock in high-resolution encoder companies. 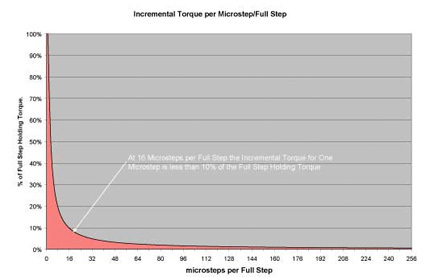 The real compromise is that as you increase the number of microsteps per full step the INCREMENTAL torque per microstep drops off drastically. Resolution increases but accuracy will actually suffer.